Explore hidden gems such as Balloon Rides and Baldacci Family Vineyards. Explore Sonoma's surroundings by going to V. Sattui Winery (in St. Helena), Robert Mondavi Winery (in Oakville) and Muir Woods National Monument (in Mill Valley). Dedicate the 28th (Thu) to wine at some of the top wineries in the area. There's more to do: admire the majestic nature at Marin Headlands and look for gifts at Passaggio Wines. To find other places to visit, where to stay, traveler tips, and more tourist information, you can read our Sonoma day trip planner . San Francisco to Sonoma is an approximately 1-hour car ride. You can also take a bus; or do a combination of subway and bus. Expect slightly colder evenings in Sonoma when traveling from San Francisco in February, with lows around 40°F. Cap off your sightseeing on the 2nd (Sat) early enough to travel to Fort Pierce. Fort Pierce is a city in and the county seat of St. You'll explore the less-touristy side of things at Cocoa Beach and Fishing Charters & Tours. 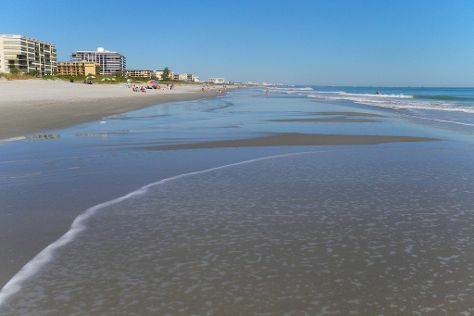 Change things up with these side-trips from Fort Pierce: Melbourne (Nature & Wildlife Tours & Brevard Zoo), Ron Jon Surf Shop (in Cocoa Beach) and Veterans Memorial Island Sanctuary (in Vero Beach). There's much more to do: learn about all things military at Navy Seal Museum, admire the natural beauty at McKee Botanical Garden, stroll through North Causeway Island Park, and admire all the interesting features of Al's Family Farms. To find reviews, where to stay, and more tourist information, read our Fort Pierce online itinerary planner . Traveling by combination of bus and flight from Sonoma to Fort Pierce takes 12 hours. Alternatively, you can do a combination of bus, flight, and shuttle; or drive. The time zone difference moving from Pacific Standard Time (PST) to Eastern Standard Time (EST) is 3 hours. Traveling from Sonoma in March, things will get a bit warmer in Fort Pierce: highs are around 78°F and lows about 56°F. Wrap up your sightseeing on the 6th (Wed) early enough to travel back home.